Reading can be very fun to some who developed reading as their habit. While on the contrary, there are learners who did not developed interest in reading and this leads to poor reading performance skills. It is indeed, that to develop love for reading it should come up with the interest and learning styles of learners. This action research was conducted to Strengthen Reading Skills through Game Based Learning (GBL) Intervention of the 47 Five-Sparrow pupils of Addition Hills Integrated School. To determine the reading skills of every learner, they were given a pre-test on different reading levels such as cvc, phrases, and sentences from selected texts and were taught using grade level texts from different learning resources and other selections during their remediation classes. The GBL intervention was utilized to develop and encourage learners to read. This same process was done repeatedly during remedial classes. This study was completed after three months of administration which started from the pre-tests through process, post-tests, gathering of data, interpretation of results up to enumerating the findings of the study and lastly the recommendations. There were total of 47 pupils in grade five section sparrow they all took the pre-test reading remedial class. The researcher conducted this, to assess the reading level of the respondents. The result of the pre-test shows out of 47 pupils there were 6 who can only read CVC (Consonant Vowel Consonant), 4 who can only read words, 2 that can only read phrases and 35 of them can read independently. This game is very popular mobile game; the researcher modified the game mechanics to fit the study in which the respondents have to guess the jumbled letters to form new word, once new word is formed. He will read a sentence containing the new word formed. Each respondent were given 10 minutes to form 10 new words. This game is all about compound words, the researcher provided a table placed the list of words and a box also containing words. Each respondent will have to pick words from the box matching it on the other word written in the table; once compound words were formed the respondent will read it and write a sentence using that word. Each respondent were given 10 minutes to complete the table or to complete 10 compound words. respondents were given letter dice they will form words out of it, the researcher will make sentences out of the words formed, 10 minutes will be given for each respondents to formed 10 words. Respondents will be given 10 sentences to read each sentence has an underlined word which they will find in the word puzzle. 10 minutes will be given to respondents to form new 10 new words. Each respondents will read a short story or selection. There are 10 questions and they will ask one another, each respondent have 10 minutes to answer all the questions. The respondents also identified which GBL they like the most and which they don’t like. After the GBL intervention the researcher conducted a post test to determine the affectivity of the GBL, the result shows that out of 12 struggling readers, 3 were able to read phrases and 9 were able to read sentences independently. The successive application of GBL to reading intervention, the researcher as the English teacher had observed that the respondents became more attentive and they can easily pay attention to their reading habit. They are now more eager to read since they find out that they can also play while learning to read, thus, this will prepare themselves to broader and complex reading activities when they become grade six students. Moreover, GBL interventions helped the struggling readers to be more books friendly and strengthen their reading skills. As the result of this study revealed that 95 percent of grade five sparrow were able to read sentences. It is with so much confidence that the researcher was able to diagnose and adopt an intervention that will help struggling readers. As an English teacher, making my students read independently is one of my dilemmas. In our daily routine inside the classroom I was able to identify students who struggled when it comes to their reading skills. And this problem was so quite alarming considering the design of the K to 12 curriculum which was patterned on 21st century that will be more on child centered strategy with the use of differentiated instructions. Having an average of 47 pupils in a class would be a very challenging task as a teacher, plus the frustration level results of our school PHIL-IRI pre-test and add to that is the numbers of struggling readers will definitely let you think of some other way to help them in such a way that you will be giving them adequate learning aligned to the Department of Education Mission and Vision. I always make sure to self-reflect each time I had an engagement with my class; I even started applying several strategies to help them read. As I noticed, these pupils can actually read, not that independent but enough for me to discover that they have the skills within them and that need to be strengthened so that they will be encourage reading. So I came up with my study, hoping that this will help me in dealing with struggling readers. It is with so much confidence that through this study I will be able to uplift their reading skills and make them a leaner that will develop their interest and love for reading. The purpose of this study is to develop a reading intervention which will be an all-inclusive approach or strategy that would develop the interest of my pupils love for reading and that they will make a good reading habit. This process will help them to become more aware of their reading skills and enabling them to make reading as part of their study habit and to enhance their capabilities in using the English language. Game Based Learning (GBL) is a type of game play that has defined learning outcomes. Generally, game based learning designed to balance subject matter with game play and the ability of the learners to retain and apply the subject matter to the real situations. Because reading is very boring task to some learners, I started to utilized GBL intervention to strengthen the respondent’s skills interest in reading. Since the students will enjoy if they will play or having fun, the main strategy of this study is to have fun while at the same time learning the easiest way. Based on the result of PHIL-IRI Pre-test, out of 47 grade five sparrow pupils, there were just 2 pupils who can read independently, 33 on their area of development means that they can read sentences, while 12 pupils were considered as struggling learners. These learners find it very difficult to read since they don’t have the interest to read any books. Having this kind of intervention helped them to bring back their interest for reading. The researcher further believed that this study will have an impact on the respondents reading skills; this will make them adept in reading and eventually become intentional readers or learners once introduced with new reading materials including viewing activities. Thus, this would make them independent readers who can communicate well both in oral and in written forms. This study involves the researcher, the school principal and the 47 Grade Five- Sparrow pupils who are the respondents for this study. The success of this research made possible through the support of the school principal, from the implementation up to the end of the study. The result of the PHIL-IRI pushed the researcher to conduct and come up with this study. Sourcing of data through English teachers and likewise an interview with the respondents including parents and teachers. The researcher made a letter to the office of the school principal informing about the study. The school principal fully supports the implementation of the action research in school. Scheduling on the availability both the researcher and respondents time was done in order to meet up the study. Other related concerns such as the production of the different materials needed by the researcher were properly negotiated to the principal. 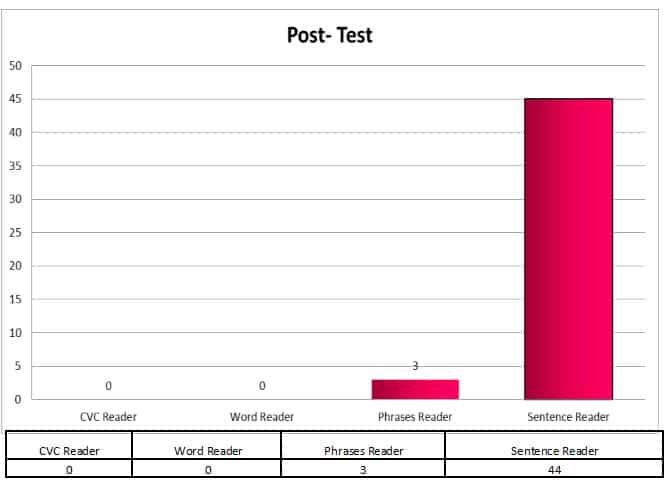 The researcher conducted Pre-test assessing the respondents through various text activities involving reading CVC, phrases, sentences, short story and paragraph. After the Pre-Test the researcher clearly identified the target of the study. The researcher used resources from the internet to gather data. He made some modifications and innovation to the different Game Based Learning (GBL) interventions to fit the study. The respondents were given specific time and number of items or activities for each Game Based Learning (GBL) intervention. The results of the activities were recorded by the researcher to determine the improvement of the respondents in each activity. After completing the allotted time and cycle for GBL activities, the researcher conducted a Post-test to determine and track the improvement of the respondents when it comes to their reading skills, and also to measure the success of this study. Finally, based on the different GBL interventions, the respondents were asked to rate which GBL intervention they liked the most and they don’t liked. The purpose of which was for the researcher to identify which among the GBL intervention fitted the interest of the respondents. Table 1. Shows the result of Pre-Test conducted by the researcher prior to the implementation of the study. Based on the result of the Pre-Test, 6 respondents CVC readers, 4 word readers, 2 phrases readers, and 35 were sentence readers. A total of 12 readers such as, the CVC readers, word Readers and the phrases readers were identified as struggling readers; they are the target respondents of the study. Table 2 shows the result of Post-Test conducted by the researcher. Out of 12 struggling readers respondents there were no longer CVC and word reader, 3 phrases readers and abrupt increase of sentence readers. The table above shows the improvements of the respondents based on the post-test given. There were no CVC and word reader, Phrases reader were 3 and sentence reader become 44. Table 3 shows the assessment of the respondents about which GBL interventions they liked the most and they don’t like. From the result above, it shows that out of 12 respondents 9 of them said that they liked the word scape game the most, 6 out of 12 respondents said that they just liked the find my pair game, 8 out of 12 respondents said that reading and asking game were just fair, while 4 out of 12 respondents did not like the word scrabble game. From the data gathered and interpreted results of the study it is deemed that Game Based Learning can be an effective intervention for struggling readers; the researcher would likely to believe that GBL intervention fits the learning styles of today’s learners, since they often engaged themselves on different games. Therefore based on the study, it would be imperative to say that learners can easily learn the lessons if there will Game Based Learning intervention, apparently learners prefer to read much if the activities will not be purely on reading. Moreover, the results show that GBL interventions converted the interest of the respondents to reading. Game Based Learning (GBL) had been proven effective teaching strategies, but utilizing it as part of reading intervention was often happened inside the classroom. As the result of this study shown, the researcher will highly recommend the used GBL interventions to teachers since non-readers and slow readers are always the problem of teachers, several reading interventions were developed but still this problem manifested in the teaching and learning process. The researcher would like to recommend the use of GBL interventions in reading to augment the current problems among teachers when it comes to reading skills of the students. To the principals and different curriculum implementer, because number of non-readers can affect the performance of the school as a whole; therefore principals being the head of the school are encourage entertaining the use of GBL interventions in reading. Seminars and other related activities for the teachers shall be conducted to fully support the implementation of GBL intervention. Public Elementary School Teacher, Handling English Subject and have been teaching for six years at Addition Hills Integrated School, Mandaluyong City. Currently a class adviser of Grade four .